In 8 nights I will not be falling asleep on a soft European pillow top mattress padded with a memory foam topper and an extra thick mattress pad, I’ll instead be dozing off while counting sheep jumping over me as I lay on the ground. Hard. Well, it won’t actually be that bad…I’m going to have a super soft 1 inch inflatable sleep pad between me and the ground…that should suffice! 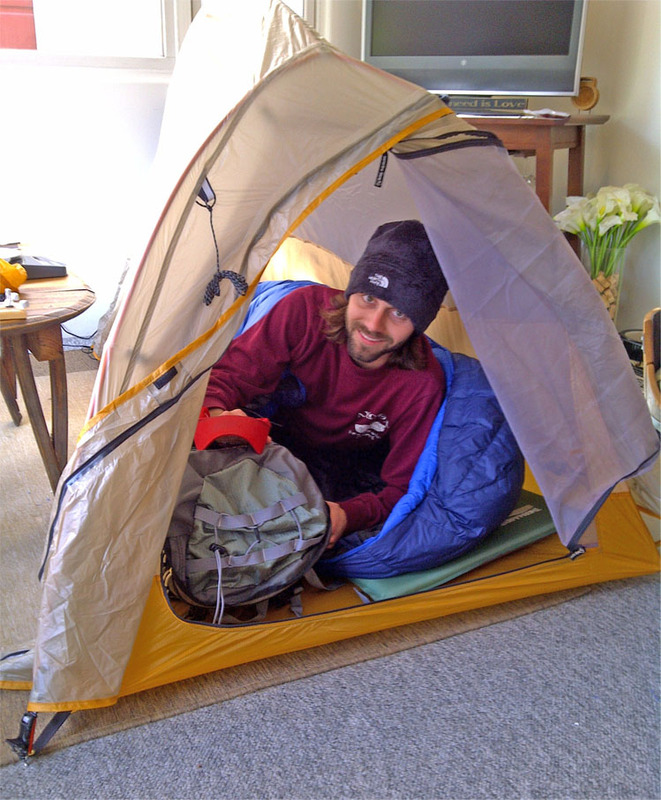 The photo here shows my new mobile home…aka, my tent. For the next 6 months this will be ground zero for all of my adventures. Only thing is, the ground underneath it will constantly be changing! The tent I picked for the trip is the Big Agnes Fly Creek UL1 ultralight backpacking tent. This mobile home weighs in at 2 lbs 9 ounces. I choose the Fly Creek over the Hennessy Hammock because I’ve never really slept in a hammock before, but the Hennessy Hammock is a pretty cool idea, look it up! 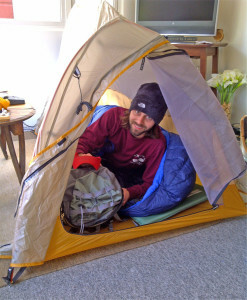 I set the tent up the other day in our apartment, it was almost too big! (or our apartment is too small) I pitched the tent, got in it, tested out the mummy sleeping bag, laid my backpack beside me, and we just fit! Most nights I may not be sleeping in the tent, I’ll be catching some zzzz’s on the floor of a 3 walled shelter with several other hikers. But for nights that the shelters are full, or when someone smells extraordinarily bad, maybe even me, I will have the freedom to move away and set up my own mobile home. The other time I might use this will be in extreme weather. If a storm rolls in and it’s too nasty to continue hiking we’ll just stop, pop up camp, and wait it out. I’ve seen several YouTube videos posted from hikers saying they had been in their tent for the better part of a day waiting out a storm…that could be a lot of hours in a small 1 person tent without TV! If you see a hammock along the AT, ask if the owner will let you lay in it. Good choice in a tent and safer than a hammock until it warms up.